Today we introduce Daiyuzan Saijoji Temple, which sits quietly and majestically atop a mountain, just two hours away from the metropolis of Tokyo. Here you can get close to nature and have an extraordinary experience. When you think of Japanese temples, which places come to mind? Many of you probably think of World Heritage site Kyoto, or Nara, or even Kamakura, famous for its Great Buddha statue. However, in addition to these popular tourist spots you can find lesser known temples with long histories, in all parts of the country. According to the Yearly Almanac of Religion (2015 Edition, The Agency for Cultural Affairs) which compiles information on religion and its current situation in Japan, there are apparently more than 70,000 temples throughout the country. Today we'll introduce you to Kanagawa prefecture's Daiyuzan Saijoji Temple, one of those lesser known temples which we'd also like guests from abroad to visit. How about going back in time to 14th century Japan to experience a temple with a slightly different kind of feeling and space from the ones in Kyoto and Nara? Here at Daiyuzan Saijoji, you can feel the warmth of the sun as you immerse yourself in the surrounding nature. A Temple With 100,000 Visitors In Just 3 Days! Daiyuzan Saijoji was first built in 1394, during an era in which Zen was blooming and prospering. Kyoto's Kinkakuji Temple was constructed during the same period. More than 20,000 cedar trees were planted on the temple precincts and many of them are now more than 500 years old. A total of 30 buildings (temples and pagodas) occupy the site which covers approximately 1.3 square kilometers. Saijoji Temple annually attracts more than 100,000 visitors during the first three days of the New Year, all hoping to soak up the dignified and magnificent atmosphere of this huge area. Now let's go for a walk on the temple grounds! As soon as you get off the bus, there you are in a completely different world! Surrounded by a lush green forest and moss-covered stones, it's almost as if you accidentally wandered right into the scene of a movie. If you'd like to fully enjoy the exquisite sight of sunlight streaming through the leaves of the trees, then we recommend coming here in the morning. You Just Might Meet the Legendary Tengu! Daiyuzan Saijoji is a temple with a deep connection to the tengu, those creatures who occupy a special place in Japanese folk religion. 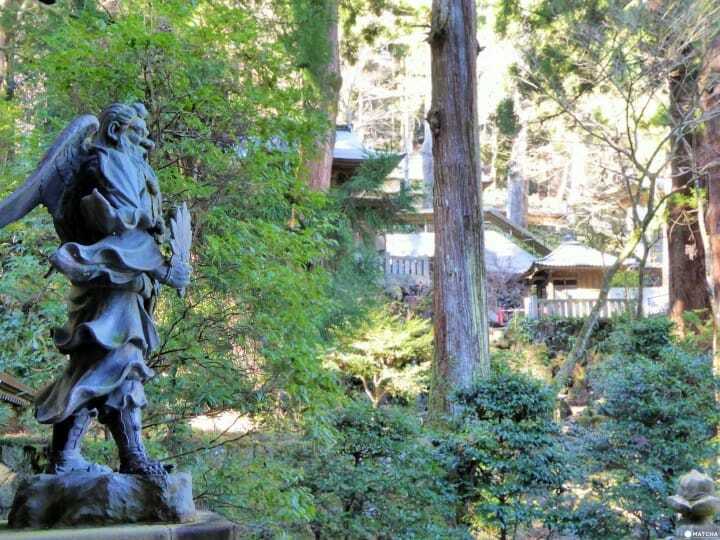 For example, folklore has it that the tengu, in a variety of different ways, supported the Zen priest who first built Saijoji Temple. Daiyuzan is the home of the tengu, and it's been said that their mighty power can be bestowed upon people if they make a pilgrimage here. Well, if you're lucky you might even be able to meet the tengu somewhere on the large temple grounds! On the temple precincts you can find a huge number of geta in all different sizes. Geta are known as footwear for tengu and when geta are neatly lined up together, they can then perform their function and duties, and it's been said that a pair of geta can also bring good luck to a marriage. Among these pairs of geta are gigantic ones, some measuring the height of a human. This is a popular picture taking spot, so while visiting here don't miss a great opportunity to capture the moment on camera. After you make your descent from the top, the souvenir shop at the base of the mountain makes the perfect ending to your day's journey. From among the many souvenirs on display, we recommend the famous tengu ha-uchiwa senbei (rice crackers). In the shape of the tengu's ha-uchiwa, or feather fan, these rice crackers have a delightful texture and crunch to them. Sold in a multitude of different flavors including miso and peanut, they are popular with all the visitors. At the shop you can also try tasting some rice crackers, but please keep in mind that this is only for sampling. If you find a flavor that you like, then by all means please feel free to buy some and take them home with you. The nearest station is Daiyuzan station, and from here it's only a ten-minute bus ride to Saijoji Temple at the top of the mountain. For some of you "top of the mountain" might sound too far away, but it's actually only a day trip, making this one of the temple's appealing points. By train, it takes anywhere from one hour to ninety minutes to get to Odawara station, which serves as a transfer point on your way to Daiyuzan station. From Odawara to Daiyuzan station it's only twenty to thirty minutes, so combined with some Tokyo sightseeing this destination is not far away. At Odawara station there's an information center for visitors to Japan, and staff members will gladly serve you in various languages, making this a useful resource for local sightseeing as well. In addition there is free Wi-Fi at Daiyuzan station, so if need be you can look up some last minute information just before arriving at Saijoji Temple. So have no worries. Some unique and enjoyable experiences await you at Daiyuzan Saijoji Temple, all within a day's reach! Languages English services are provided at Odawara station (the station you arrive at before going to Daiyuzan station). Access At JR Odawara station take the Daiyuzan line (Izu Hakone Railway) until you get to Daiyuzan station. From here it's only 10 minutes by Izu Hakone bus (headed for Doryoson). Get off at the last stop and it's right there.